I love Stilton cheese. When visiting the UK my sister buys industrial quantities, and when I arrived at my sisters house for Christmas she showed me a huge Stilton cheese recently purchased in London. 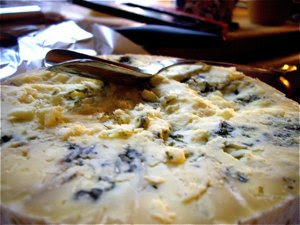 Stilton is delicious in hot food or enjoyed with crackers and as the Britons do with a glass of port. I am glad to say that she gave me a large slice of Stilton to enjoy when returning to Oslo. Stilton is a British blue cheese equivalent to the French Roquefort and the Italian Gorgonzola. As its counterparts it varies in taste according to maturity. This cheese was milder than many of the others I have tasted in my time. My sister had bought a whole cheese and she had even got a free gift with it, a spoon specially designed to scoop out cheese from its soft core. We were allowed a taste of Stilton after the Christmas dinner. My sister had (with great success) prepared a delicious succulent pork rib and she and I chose the blue cheese as an alternative to caramel mousse. We enjoyed the cheese with a glass of Sandemans port. The contrast between the salt, slightly bitter cheese and the warm sweetness of the port is sensational. I had three large shopping bags of groceries when returning from Sweden. 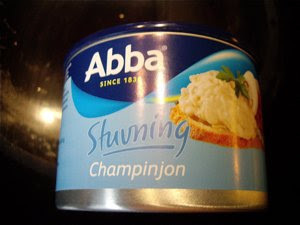 I usually buy small tins of Abba stews, as they are a great base for tasty meals. They come in reasonable sizes, perfect for one. December 25th I returned home and discovered that my grocers were closed and I had no bread. I needed a treat and found a packet of Santa Maria taco tubs, small edible containers. I opened up a tin of Abba mushroom stew, mixed in two tbsp of shredded cheese and two tbsp of crumbled Stilton cheese. To add a little kick, I added a tbsp of sweet chili sauce. 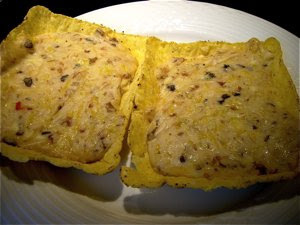 A good idea is to add a beaten egg for more richness. As the taco tubs easily burns, I decided to bake the tubs in a moderate oven (130C / 270F) until very creamy.